Designed to be installed directly onto a sloped roof, VELUX's The No Leak skylight, model VSE electric venting skylight is the perfect daylighting solution for overhead applications. It lets abundant natural light flow into the room, while blocking heat. 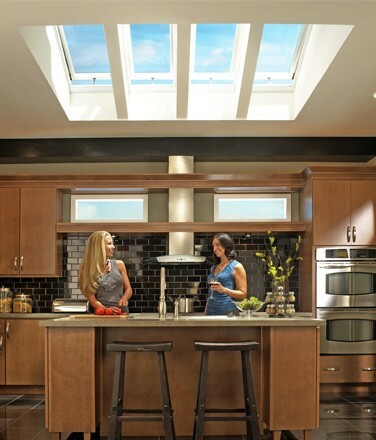 As a venting skylight, it reduces the need for air conditioning during the year, and, thanks to the chimney effect, improves indoor air quality when open by removing moisture, odors and other indoor pollutants. Thanks to a pre-installed concealed motor and control system, you’ll enjoy the one-touch convenience of a remote control or mounted keypad, and can even connect your skylights to an existing home automation system. If you forget to close your skylights, however, the rain sensor closes the VSE skylight automatically, in case of inclement weather. The No Leak skylight, model VSE also comes with optional blinds that can help provide privacy, diffused light or complete darkness. For added peace of mind, your VELUX warranty covers 20 years on insulating glass, 10 years on the skylight, 10 years on installation, and 5 years on the electronics. See VELUX warranty brochure for complete details. This product is eligible for the 10% federal tax credit.